Quorum Torpedo Natural is a medium bodied smoke with smooth, woody, and nutty flavor in a perfectly crafted 6x52 Torpedo size. I don't always need a $7 stick to satisfy my cigar needs. When out shooting sporting clays or golfing or just working around the yard, this cigar meets my needs. Nice cigar for the money. Have smoked a couple hundred and am glad they were recommended by a friend. Good wrapper and flavor. Have recommened to others. A wonderful choice for those who love cigars but have a limited budget. I really like this cigar, for the price it is the best. Sometimes it does upwrap but I order these bundles on a regular basis. These cigars are the best non expensive ones I can find. Bestcigarprices is the best literally. These puppies are my everyday smoke. They are pretty consistent with only a couple of sticks per twenty rolled too tight. Otherwise, they are a really good medium bodied smoke. Great price for a really good everyday cigar. 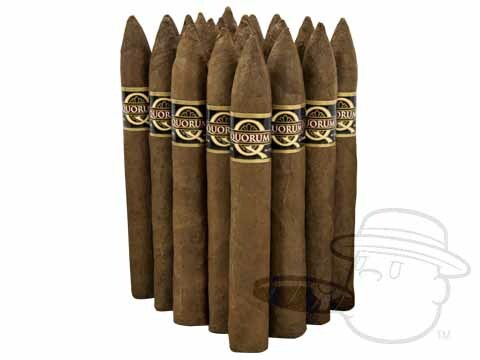 Quorum Torpedo Natural is rated 4 out of 5 based on 14 customer ratings. What are the shipping charges if I buy 3 or 4 bundles at a time? I live in Edinburg, Texas. Our standard shipping rates for UPS ground delivery are $5.95 for the first item, and $2.00 for each additional item. For example, if you were to order 3 bundles, your total ship cost would be $9.95. If you ordered 4 bundles, it would be $11.95. Also, be sure to keep an eye out for items tagged with "Free Shipping," as we always have specials running on select items, and these specials are updated frequently.